Recent medical research has provided alarming conclusions surrounding the causes, severity, and long-term effects of concussions. We now know that even seemingly minor concussions may have much more serious long-term effects on the brain. Chronic Traumatic Encephalopathy (CTE) is a progressive degenerative brain disease believed to be caused by repetitive sub-concussive and concussive impacts to the head. Concussions can occur from impacts in the lower range of 60 G’s in adult males, and even less in women and children. Currently, helmet certification testing around the globe completely ignores this critical performance metric, instead focusing helmet performance only on high-velocity impact testing. Angular Acceleration (rotational force) is generated from oblique angle impacts to the helmet surface. The result of this type of impact is shearing, tearing, and compressions of the brain within the skull. The medical community has determined that angular acceleration is the primary cause of concussion and traumatic brain injury (TBI). Laboratory testing has proven that a helmeted head sustained the same degree of angular acceleration as the un-helmeted head when subjected to identical impacts*. This is because in the traditional helmet, the helmet is directly “coupled” to the wearer’s head. ODS “uncouples” the outer shell and liner from the inner liner thereby significantly reducing the transfer of Angular Acceleration to the head and brain. Across the entire range of potential impact velocities the 6D helmet with ODS technology consistently outperforms the competition. 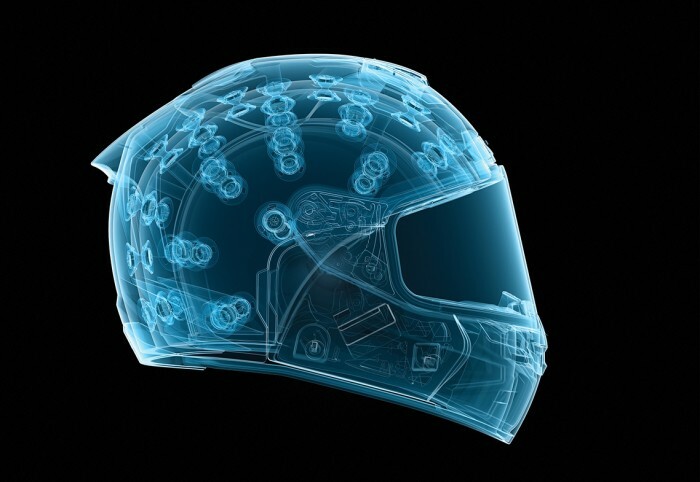 6D meticulously engineers our shells, EPS densities, damper array, quantity, and durometer to provide the best possible impact management performance for every helmet we manufacture. TTP is the measurement of time (in milliseconds) it takes the energy of an impact to reach maximum (peak) G force. Deceleration time is the single most beneficial component of reducing the severity and magnitude of any impact. The more time, the less severe the energy transfer will become. 6D’s exceptional ODS technology buys time. The really cool news here is the significant reduction in energy transfer that comes simply with time.